Disclaimer: This post is about Kingdom Hearts and is written under the assumption that you know a lot about the series already. As such, this may be confusing for you if you’ve never played these games before. Also, it should go without saying that there are spoilers in here, up to and including, the trailers for Kingdom Hearts III. So spoiler warning I guess. Kingdom Hearts is one of my favourite video game franchises of all time, and is a series that I’ve held close to my heart (no pun intended) ever since I played the original game back in 2004 when it came bundled alongside my PlayStation 2 at Christmas. In the years since then, I’ve played through every single major and minor game in the series as they’ve come out, with Kingdom Hearts II and Kingdom Hearts: Birth By Sleep being two of my favourite games on their respective systems. And with the long awaited Kingdom Hearts III just around the corner, the series has become one of the hottest discussion topics on the internet. Will it be worth the agonising 13 year wait? Will the game turn out to be a major disappointment? Will the story tie up all of the franchise’s loose ends? Will we get to see our desired OTP become canon? There are so many questions! And they have me anxious! But in amongst all of this discussion, there’s been a lot of talk about the story of the franchise and the direction it’s taken in the many years since the end of Kingdom Hearts II. Many now consider the narrative of the games to be overly complicated, convoluted, nonsensical and poorly written, and are concerned that Kingdom Hearts III isn’t going to do much to fix this. Some people have even directed these criticisms towards the earlier games, including the original, claiming that the series has always been difficult to follow, poorly written and just plain nonsensical. But I for one, don’t think Kingdom Hearts is badly written in the slightest, nor do I think it’s even all that convoluted or complicated to follow. It’s definitely not a perfect story, and it has its fair share of retcons and continuity errors due to the way the games releases have been handled over the past decade and a half. But I figured I’d address the three most common criticisms with my own thoughts and give some positive light to this series story because… I love it. So much. It is valid? : A little. But it’s entirely intentional and makes the story work better as a result. This is one that makes very little sense to me because there’s a very simple solution to solving this one. Yeah, it’s a little messy how the games were released. You’ve got Kingdom Hearts, then instead of Kingdom Hearts II, you’ve suddenly got Kingdom Hearts: Chain of Memories. Then you’ve got Kingdom Hearts II. But wait! The tutorial chapter of Kingdom Hearts II has references to another game that came out after it. What gives?! And then there’s a prequel game that came out after the first two mainline games? The heck is going on?! Look, this is all really confusing to approach if you’re new to the series, but the solution is very simple: play the games in the order they were released! I’ve never quite understood why anyone would ever choose to do anything else. The release order of the games was the intended order because it’s the order in which the stories of each game were written in. Even if a game references another that was released after it, this was purely intentional to create a sense of mystery. I’m going to use the prologue of Kingdom Hearts II that I just referenced above as an example, as it’s the one that people tend to pick on the most when it comes to the games release order. So at the beginning of Kingdom Hearts II, you play as Roxas, a character who you know absolutely nothing about going into the game. Throughout the prologue, weird stuff begins happening to disrupt his daily life, and there are many flashbacks and dialogues with other characters that both suggest and show parts of his backstory. It’s a compelling mystery, but one that also has you completely confused and bewildered. But as you play as Roxas, more about who he is slowly becomes clear and his story begins to unravel. We start to learn that Roxas was once a part of the Organization, the antagonists of the series, but that his memory was erased. We learn that the weird stuff going on in his daily life is due to the fact that he’s living in a simulation, used to keep his now amnesiac self imprisoned. And at the end of it all, we finally learn that he’s actually Sora’s Nobody, and that he’s destined to rejoin with him so he can awaken from his year long slumber and continue his journey. A lot of people have criticised this opening for not explaining these things from the get go, and that the game 358/2 Days, which came out after the second game and explores Roxas’ backstory in detail, is necessary to understand what’s going on in the prologue. But I’d argue against this, because the prologue was always intended to be a mystery that you slowly unravel as you play. Nomura wanted you to question what was going on in every step of your journey. He wanted you to slowly get to know Roxas and watch what he thought was his reality gradually crumble as you progress through the tutorial, so that by the time he rejoins with Sora and has to say his goodbyes, you feel sad. You don’t want to say goodbye to Roxas, but you also want to see Sora again. It’s genius, and much of the impact would be lost if you went and played 358/2 Days and went into the prologue of Kingdom Hearts II knowing exactly who Roxas is, where he comes from and what he’s already been through. And this is just one, lengthy example. Kingdom Hearts is a series that’s full of these kinds of scenarios, where a game will reference another game that came out after it, but that’s entirely intentional. These stories were written with gaps in them to allow the player to fill them in as they play, with the future games providing any clarifications or missing details to help completely bridge the gaps. This is actually how a lot of stories spanning multiple entries work, and it’s not a narrative technique exclusive to Kingdom Hearts. I guarantee that if you play the games in the order that they were released, with this in mind, that things will make a lot more sense. The chronology is a little screwy, but it’s nothing that can’t be solved by simply playing the games in the order they were intended. Is it valid? : Not at all. This is something that I really struggle to understand because there are no “side games” in Kingdom Hearts. Except maybe that online browser game, but that doesn’t even matter in the grand scheme of things because it doesn’t add much of anything to the greater narrative. A lot of outsiders, and even some fans of the series, seem to have this weird idea that only the “numbered” games, 1, 2 and 3, “matter”, which isn’t even remotely close to being true at all. Speak what you will about the quality of Kingdom Hearts: Chain of Memories (I’m not the biggest fan myself), but despite its title, it’s actually the sequel to the original Kingdom Hearts. Or to better put it, it’s an interquel that bridges the gap between Kingdom Hearts and Kingdom Hearts II and as such it’s an entirely necessary part of the story that should be played. The same applies to other non-numbered entries. 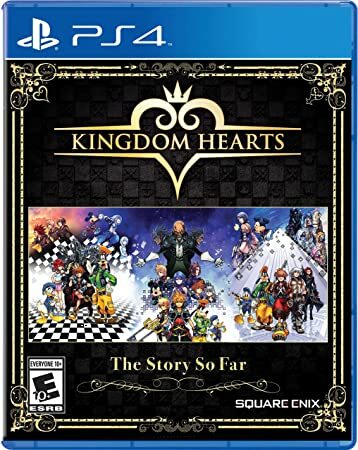 Kingdom Hearts: Birth By Sleep is a prequel to the entire series that explores how the world ended up in the state it was in during the first game. It details the origins of the keyblade, the creation of the Heartless and the first moves of the series’ antagonist, Master Xehanort in his quest to find the ever elusive realm of Kingdom Hearts. This game is crucial to understanding very important parts of the much larger narrative, and is referenced heavily in all of the games that were released after it. 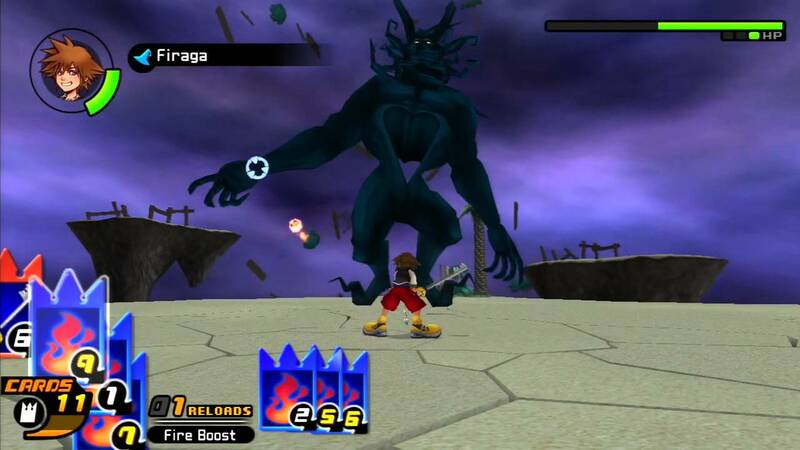 Dream Drop Distance, like Chain of Memories, is another interquel, which bridges the gap between Kingdom Hearts II and the long-awaited Kingdom Hearts III and is going to be essential to understand the events of Kingdom Hearts III because it sets up the final conflict that is going to take place in that game. And honestly, I’m not even sure why this is all that surprising to people. There are hundreds of gaming franchises that do this with their stories. Look at Metal Gear Solid, which not only has a bunch of numbered entries, but also has a ton of “side” games in between those numbered games that are necessary to fully understand the entire story. And then there’s the argument that all of these games are split across multiple consoles, both portable and home consoles, and yeah. I can’t really defend this. …Or rather I couldn’t until recently, when Square Enix re-released the entire series across three HD collections on the PlayStation 4. You can even get all three of them as one package, and therefore can essentially get the entire series of Kingdom Hearts, including the upcoming Kingdom Hearts III, on the PlayStation 4 for a very fair price. The only exceptions to this are 358/2 Days and Re:Coded, both of which come as cutscene movies instead of the actual games themselves, but… The games weren’t really all that great as “games” to begin with, and the story is left entirely intact. So yeah, there aren’t any “unnecessary side games” and you can get all of them in one place. Easy peasy. Is it valid? : Not in the slightest. Alrighty, so this is the big one, and it’s something that I’ve seen echoed time and time again, even in the recently released reviews for Kingdom Hearts III, and it really, really bothers me because I don’t think it’s even close to being valid. Say what you will about the writing of Kingdom Hearts. Even as a fan of the series, I do think it’s a little messy in some places. Heck, it can even be downright comedic at times, like when they pretended to kill off Goofy in Kingdom Hearts II and had Mickey Mouse angrily shake his fist and say “They’ll pay for this!” before running into a battlefield full of Heartless in a rage. But where Kingdom Hearts really shines, and always has, is its character writing. These characters are all brimming with personality and they all have interesting and well developed story arcs. No matter which side they’re on. But I guess I should give some examples to better illustrate my point. So lets look at the protagonist, Sora. He’s often criticised for being too optimistic and barely developing over the course of the series, but I have to disagree with that. Heavily. Yes, Sora is often always smiling and always approaching things with a happy-go-lucky attitude, but that doesn’t mean he hasn’t developed or that he isn’t a good character. 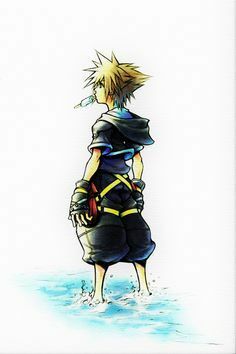 Sora started out as a clueless boy who knew nothing of the bigger world beyond his tiny set of islands, but over time developed into a mature and responsible young warrior, given the difficult task of sealing away the darkness and saving his friends in the process. And during all of his adventures, he came across many obstacles, some of which left him broken and defeated and had him doubting himself and if he was up to the task. When it was revealed that he wasn’t the true keyblade master, his confidence was shattered and he almost gave up on his quest entirely, before winning it back the due to his strong heart after the weapon realised its true master had been seduced by the forces of darkness. When he discovered that defeating the Heartless was actually helping the antagonists, he almost gave up on fighting entirely and wound up in a depressed slump, unable to do anything until he was reassured that he needed to keep pressing on. When he failed his Mark of Mastery exam at the end of Dream Drop Distance, and Riku passed, you’d expect that Sora would have responded with jealousy, due to how he and Riku were always competing and getting jealous of one another during the original Kingdom Hearts. Yet, he instead responded by congratulating Riku on his success and went outside to reflect on his failings and came to the conclusion that he still has a lot to learn. To say that Sora hasn’t been through a lot or that he hasn’t matured at all since Kingdom Hearts, even slightly, is just… Ludicrous. And he’s just one example. There’s also Riku, a once pure hearted and selfless boy with a desire for adventure who fell down the path of darkness and became so seduced by it that he almost lost his humanity. Who then had to conquer the darkness within himself and who after years of this inner struggle managed to both control it and overcome it and become a fully fledged keyblade master and join the side of light. There’s Kairi, who’s always been the damsel in distress but now has a desire to become a keyblade master herself and is willing to go through rigorous training with Lea to help protect her friends and aid them in the final battle. There’s Terra, who like Riku, was a determined young man who only wished to do the right thing and keep his friends safe, but who fell to the darkness and killed his own master in order to do so. But unlike Riku, he never managed to return from his dark path and was completely consumed by it, and his entire existence was erased. There’s Aqua, who acted as a guardian to the realm of light, doing everything she could to save her friends, and everyone else, from the darkness but in doing so, found herself trapped in the Realm of Darkness with no escape. She sacrificed herself to protect everyone, and if the trailers for Kingdom Hearts III are anything to go by, it looks like her extended time within the Realm of Darkness have been anything but kind to her. She’s no longer who she used to be. And there are so many more. The Organization, the villains who’s evil plans were all because they simply wanted to become human again. Master Xehanort, the scientist who’s curiosity for the unknown set his diabolical plans for war and destruction into motion. Xion, who struggled with the realisation that she was nothing more than a part of someone else and was never a real person. All of these characters, no matter which side of the conflict their on, or how big or small their role in the narrative is, have some kind of well fleshed out developed story arc. Every single one of them is a multilayered character, with complexities and personality. If any of these examples are “one dimensional” to you, then I don’t know what isn’t. Regardless of what you think of Kingdom Hearts and its story, I hope I was able to at least give some what of an inkling as to why I personally don’t have a problem with the things people often talk about. And no matter your stance on the state of it all, I think there’s one thing we can all agree on. We can’t wait for Kingdom Hearts III. Let’s hope the lengthy wait was worth it. Posted in Lethargic Rambles, Video Games.Tagged Anime, Aqua, Birth by Sleep, Blog, Blogging, Chain of Memories, Disney, Games, Hearts, In Defense of, In Defense of the narrative of Kingdom Hearts, Kairi, KH, KH2, KH3, Kingdom, Kingdom Hearts, Kingdom Hearts II, Kingdom Hearts III, Leth, Lethargic, Lethargic Ramble, Lethargic Ramblings, Ramblings, Riku, Sora, Square, Square Enix, Terra, Ven, Ventus, Video Games, Xehanort. My daughter adores these games! It came out on the PS/2, didn’t it? Or maybe before? I remember watching her play on the PS/2 and marveling at what a deep and engrossing game it was!